All You Can Eat at Shiki … everyday? If people think a restaurant can survive on all you can eat service everyday, Shiki Sushi has a secret. Diners have only two hours to order what they like, and the time it takes to bring out what people ordered will vary on the complexity of the meal. True to other establishments‘ rule about this type of service, any item left over after this amount of time, people will have to pay full price. I tried Shiki five times now over the past few months with all-you-can-eat in mind. After the last visit, I can weigh in on how well this service works, and offer a few tips. Foodies have to order what they want from a predetermined menu. The selection is very good, so there’s no need to order everything in one go. Should that be the case, the meal may never arrive. Start with the light items first, like the sunomono salads, nigiri or sashimi offering which usually comes in pairs. The wait time for these are reasonable. The makis take time to be made right. When that’s served, say you’re ready to order the second round. While you’re eating, the chefs can prepare the cooked or deep fried meals. The sushi pizza is to die for; the crispiness of the pancake rice bed is nicely done, and the cold toppings make for a nice combination to feel in the mouth. They are nicely presented and are topped up with avocado, uni and tamago. On a regular dining visit, I have to wonder how wide of a circumference this item can become. On an all you can eat menu, I imagine this item is sized down to accommodate being made in time. 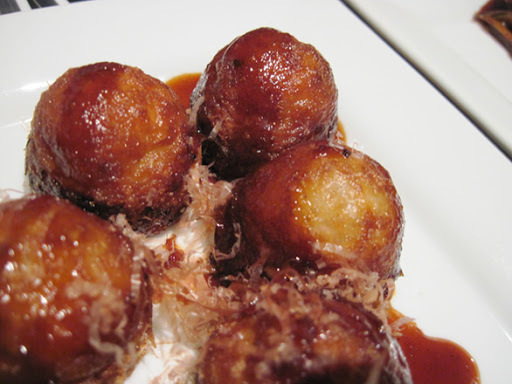 The takoyaki is toasty hot, nicely seasoned and perfectly chewy. While this item is light on the octopus, the overall presentation is very nice. I wished that they included shaved bonito leaves, because that defines what a good takoyaki meal should be. 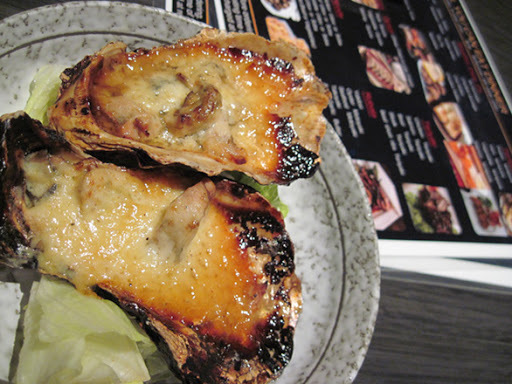 I even tried the oyster motoyaki, which is basically baked chopped oyster bits in cheese. It’s greasy, but delectable. The firm crispiness of the top crust made for a nice flavour with the minced items on the bottom. Sadly, the amount of oyster meat used is minimal. I’d have to order three of these plates in order to get a equivalent of maybe two meaty behemoths. The service time is often a complaint from diners wanting to eat as much as they can. But when the group is there for a casual experience, the time spent just chatting will make the wait bearable. I suspect management may be purposely slowing things down otherwise their food stocks would disappear. Hungry bears are one thing to worry about since some folks are trying to fatten up for the winter season to stay warm. But maybe going to Goldstream Park is a better idea? Fresh salmon is abound right now. 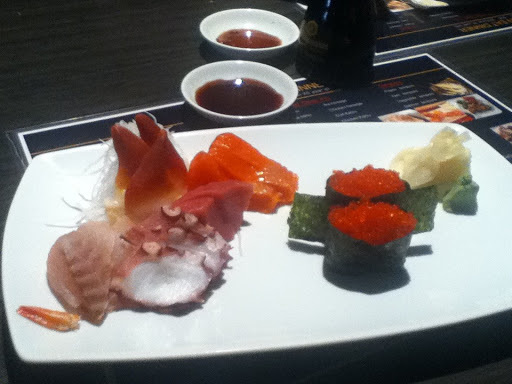 This entry was posted in Food, Reviews and tagged Asian, British Columbia, Downtown Victoria, Japanese, Sushi, Vancouver Island, Victoria. Bookmark the permalink.